Hot on the heels of the just announced pre-order and availability dates of the Apple iPad, here comes an interesting report from a survey conducted by ChangeWave Research. According to the report – 40% of would be e-reader buyers would like to get the iPad than the Amazon Kindle, Sony E-Reader or Barnes and Noble’s Nook. ChangeWave surveyed 3,171 consumers right after Apple announced the iPad sometime in February. Respondents were presented with the features and capability of the iPad before they were asked if they are keen on getting it. The results showed that 4% respondent that they will most likely buy the iPad, while 9% answered somewhat likely. Quite interestingly, the percentage of those who answered that they are most likely to buy the iPad is almost the same percentage as those who plans to buy it prior to the iPad’s launch. 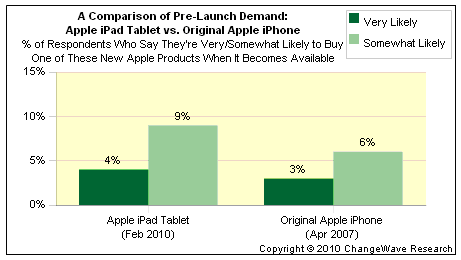 This means that after knowing about the specs and features of the iPad, those who wants to get it remains the same. To make more meaning to their data, ChangeWave also compared pre-launch demand of the iPhone and the iPad and found that the pre-launch demand for the iPad is greater than the pre-launch demand for the iPhone. Another interesting findings of the report showed that current Kindle and other e-book readers replied that they would have bought the iPad if it were already available when they purchased their current e-readers. So, this somehow shows how the iPad will affect sales of existing e-books since potential buyers might also consider getting the iPad instead. So, let me now turn the table to you our dear readers. If you are planning to get an e-book reader, will you consider getting the iPad or the other e-book readers available in the market today?